Gregory, Patrick T. and K.w. Stewart. "Lizard". The Canadian Encyclopedia, 30 May 2018, Historica Canada. https://www.thecanadianencyclopedia.ca/en/article/lizard. Accessed 24 April 2019. Lizard is the common name for members of the most diverse of a group of living reptiles. Pelee's main role as a national park is the preservation of a portion of the Canadian Carolinian Zone. This zone is characterized by many animals and plants not found in other parts of Canada, such as these five-lined skinks, eastern Canada's only lizard (photo by J.R. Graham). Lizard is the common name for members of the most diverse of a group of living reptiles. 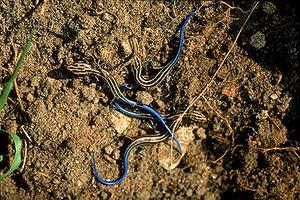 Formally, lizards include amphisbaenians (worm lizards) and snakes, but we consider the latter separately here. Together they form the group Squamata. There are more than 4450 species of lizards worldwide (more than 7300 if snakes are included). They range in size from tiny 2-5 cm long Sphaerodactylus geckoes to the 3 m long Komodo dragon. All lizards have dry skin covered with epidermal scales. Most lizards have legs, a long tail, movable eyelids and well-developed ears. 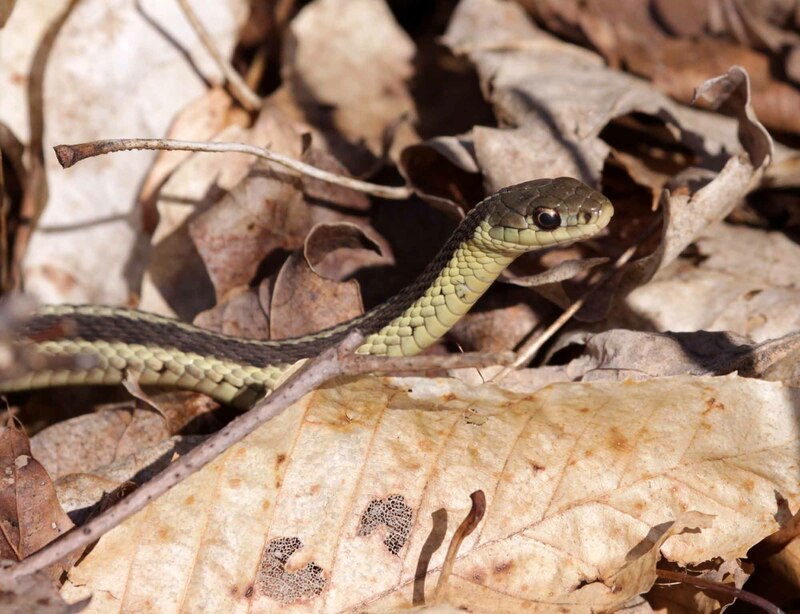 Some have adopted snakelike habits and may be very long and slender, with tiny or not externally visible legs. 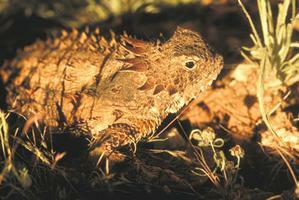 Burrowing lizards, such as amphisbaenians, have highly reduced eyes and ears. Snakes are thought to have evolved from lizard ancestors that underwent reduction of limbs, eyes and ears while adapting to a burrowing lifestyle. Although most lizards are small, they usually are capable of fast movement and will easily outdistance a human pursuer to cover. The limbs are held in a sprawling position directed outward from the sides, but when lizards run, the body is raised clear of the ground. A few, such as the Australian frilled lizard and the basilisks of Central America, have large hind legs and can run with forebody and forelegs off the ground and the tail elevated as a counterweight. 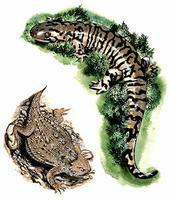 Two species, the gila monster of the southwestern United States and the Mexican beaded lizard, are venomous. Most lizards occur in warm, sunny, dry climates and all species in Canada are found near the country's southern border. 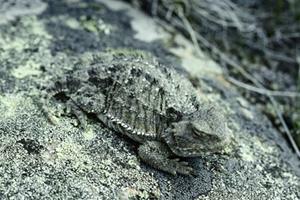 Typically, they occur in habitats that provide a combination of cover and opportunities to bask. Six native species, ranging 8-21 cm long, occur in Canada: northern alligator lizard (Elgaria coerulea, family Anguidae) in southern British Columbia, including southern Vancouver Island; pigmy horned lizard (Phrynosoma douglassii, family Phrynosomatidae) in the extreme south of the Okanagan Valley, but now regarded as extirpated in Canada; greater short-horned lizard (P. hernandesi, family Phrynosomatidae) in southeastern Alberta and southwestern Saskatchewan; western skink (Plestiodon skiltonianus, family Scincidae) in south-central British Columbia; northern prairie skink (P. septentrionalis) in southwestern Manitoba; and five-lined skink (P. fasciatus) in southeastern Ontario. An introduced European species, the common wall lizard (Podarcis muralis; family Lacertidae), is established on southern Vancouver Island; it is similar in size to native species. Although there are several species of snakes in Canada, there are no amphisbaenians. 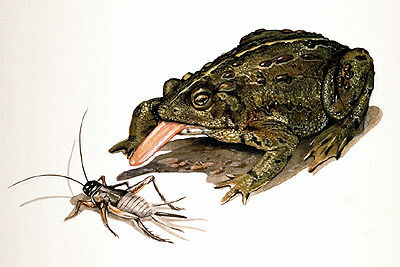 Most lizards are predatory, feeding on small invertebrates, especially insects. However, the South American tegus and Old World monitor lizards will eat other reptiles and even mammals. They have sharp-edged, shearing teeth, and a movable joint between the skull and jaw suspension that allows the lower jaw to move back and forth in a sawing motion. This enables them to cut pieces from prey too large to swallow whole. The world's largest lizard, the Komodo dragon (Varanus komodoensis), is a monitor lizard that attacks and kills deer and wild pigs, and has been known to attack humans. 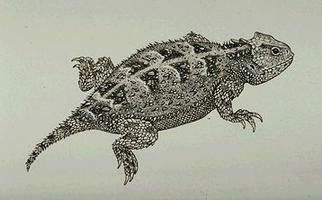 Tropical New World iguanas and some Old World agamas are the only herbivorous lizards. These lizards have deeper skulls, which accommodate more powerful jaw muscles than most lizards, and a less mobile jaw suspension. These adaptations allow them to bite or tear off pieces of vegetation small enough to swallow. Most lizards produce eggs that must be fertilized inside the female. Mating usually is preceded by complex courtship behaviour and by display and combat among males to defend territories. In most species, the female lays leathery-shelled eggs in a protected site and then abandons them, although the female remains with the eggs in some species (eg, western skink). In other species (eg, northern alligator and horned lizards), females retain eggs inside their bodies until fully developed young are born. Some whiptail lizards, lacertas and geckoes occur only as females that lay fertile eggs without mating, one of the few cases of parthenogenesis found among vertebrates. The adaptation may have developed to allow small numbers of lizards to colonize disturbed habitats and small, isolated patches of suitable habitat. Eric R. Pianka and Laurie J. Vitt, Lizards: Windows to the Evolution of Diversity (2003); F. Harvey Pough, Robin M. Andrews, John E. Cadle, Martha L. Crump, Alan H. Savitzky, Kentwood D. Wells, Herpetology, 3rd ed (2004); George R. Zug, Laurie J. Vitt, Janalee P. Caldwell, Herpetology: An Introductory Biology of Amphibians and Reptiles, 2nd ed (2001).